LET THE TRADE MISSION BEGIN! 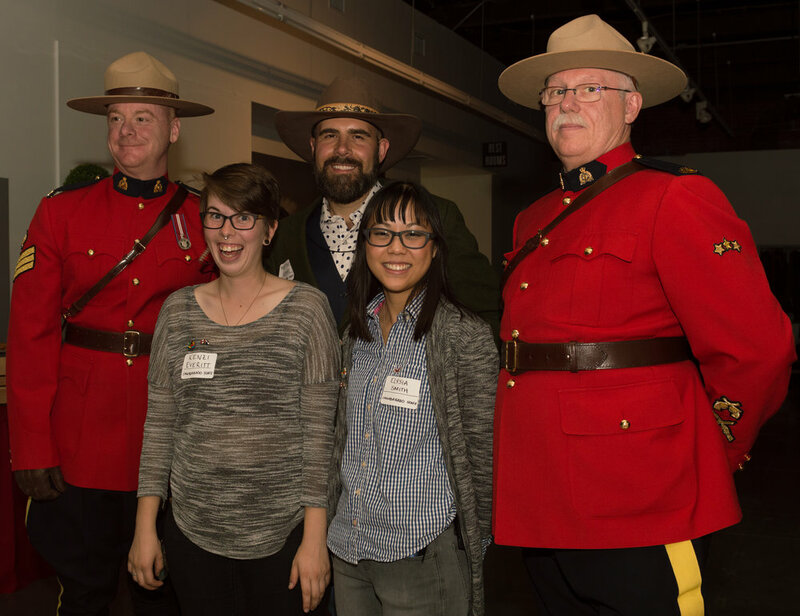 Canadians, Americans, industry representatives, city employees, artists, musicians, delegates, agents, and others of all sorts mingled alongside Canadian Mounties at the Canadarado Welcome Reception on November 9th. The multinational energy was unmistakable as guests made friends on their way from the traditional Canadian poutine bar to the build-your-own beaver tail sundae buffet, grabbing conversations, Canadian brews, and photo-booth snaps in front of the Colorado Rockies. Stationed in the far corner, Adam Baumeister of Meep Records recorded spontaneous tracks on his signature medium: poly carbonate (plexiglass). Several musicians in attendance took advantage of this rare service - Brent Cowles, members of iZCALLi, and Little Destroyer all recorded acoustic tracks. Even Stéphane Lessard, the Consul General of the Consulate General of Canada in Denver, took his skills to Baumeister's music corner to record never-before-heard original songs. Making his way to the stage, Lessard traded his guitar for a microphone to deliver the francophone invocation to tonight's welcome reception for the Canadarado Musical Trade Mission. He greeted us in both French and English, emphasizing the importance of promoting culture and cultural exchanges, and in particular, continuing to build robust connections between Canada and the U.S. Mountain West. He also gave a warm welcome to the four Canadian bands participating in this Canadarado weekend: Little Destroyer from Vancouver, Ponteix from Saskatchewan, Yes We Mystic from Winnipeg, Manitoba, and nêhiyawak from Edmonton, Alberta. Next to speak was Lisa Gedgaudas, the program administrator for Create Denver at Denver Arts & Venues. She’s also head of drafting the Denver Music Strategy, and recently listed among the top 100 creatives in Colorado by Westword. She introduced the key collaborators of Canadarado – those people and organizations that made this event happen: FACTOR Canada, Denver Arts & Venues, UC Denver College of Arts and Media, and the Fort Collins Music District. Gedgaudas spoke passionately about Denver’s changing identity: instead of a “fly-over” city, Denver is slowly becoming a global destination for music. She also pointed out how Denver’s changes have arrived with a price tag: “Denver is growing up quite a bit,” she explained. “It’s hard for anyone to afford to live here, especially rising artists and musicians.” Echoing Stéphane's sentiments of promoting cultural exchanges, Gedgaudas emphasized her excitement for musical trade missions, with hopes that in the near future, Colorado bands will complete the exchange by visiting partner cities in Canada. Gedgaudas wished Canada a "Happy 150th Birthday!" before handing the microphone over to Duncan McKie, head of FACTOR Canada. McKie described FACTOR as a public-private partnership that funds upwards of 2500 projects per year. Over $30,000,000 is spent by the Federal Government per year for projects aimed at developing and marketing Canadian talent. McKie spoke of Canadarado as a "full blown export mission to Denver," and a huge asset to the city in that it will help formulate and guide the direction of the Denver Music Strategy. Rounding up the evening were Storm Gloor, Associate Professor of UC Denver's College of Arts and Media, and Shawn King, Music Ambassador for Colorado Creative Industries. Both Gloor and King were instrumental in making Canadarado an actuality: Storm has nurtured and developed many young men and women to take leadership roles in the industries of music and entertainment, many of whom were directly involved in the production of Canadarado. Shawn King, also known as the drummer in the band DeVotchKa, is an advocate for taking stock of local music resources to help cities like Denver tap into the local music scenes. His current project, the Colorado Music Licensing Project., has helped local bands such as the Trout Steak Revival with King's "farm to table" music analogy. While the welcome reception outlined the goals, rationale, and participants of Canadarado, it also succeeded in fostering an atmosphere of community and collaboration that would follow through all the events of the weekend. Some, but not all, of the Canadarado participants! 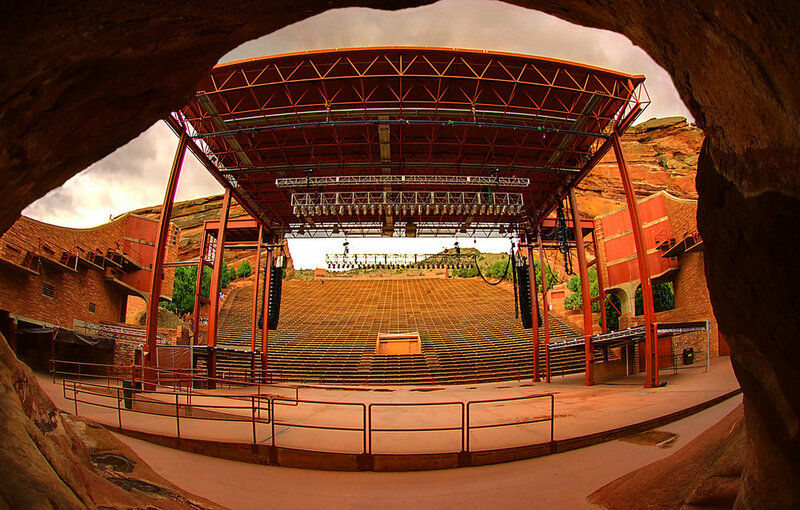 Canadarado’s next stop was Red Rocks Amphitheater for a tour led by none other than Tad Bowman, Executive Director of Red Rocks. Over the course of a bright, warm, late fall morning, Bowman relayed the story of how this naturally formed open-air amphitheater came to be one of the most popular concert venues in the U.S.
As we gazed over the upper deck at 6,500 feet, Bowman told us how Red Rocks was purchased from a private owner in 1928 for just over $54,000. He joked, “I think we may have earned that money back by now!” Pointing out several monoliths that surrounded us, Bowman indicated that the structure of the theater allowed for near-perfect acoustics. In addition, the sandstone ledges hold many thousands of years of history. Geologists and music lovers alike have marveled at the number of fossils hidden in the rocks. Bowman led us through the Visitor’s Center where memories in the shape of posters, plaques, and multimedia exhibits gave us a better idea of the importance of this unique venue to the local and national music community. 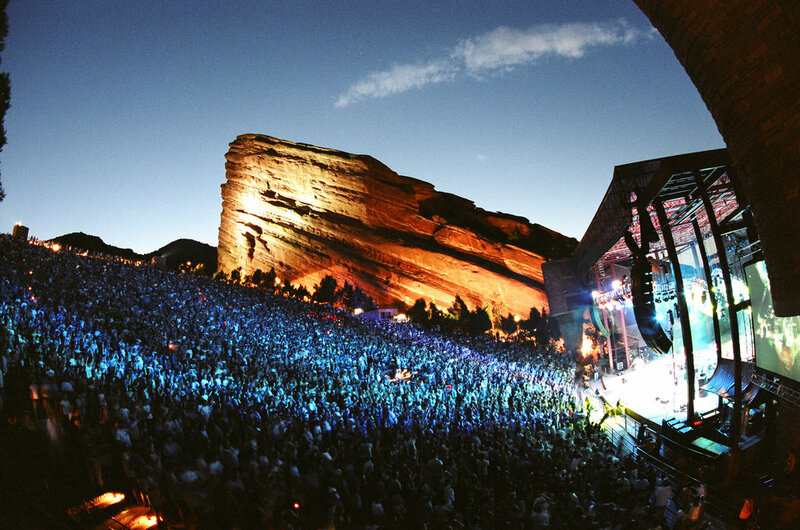 Red Rocks holds the record for top attendance of all major amphitheaters, surpassing 1 million attendees in 2015. Next, we made our way down the 70 rows of seats to the main stage. As we descended, we noticed how many people were using the stairs, rows, and seats for varying degrees of cardio workouts. There were joggers, runners, dog walkers, and families strolling together, hand-in-hand. Also, there was no avoiding the droves of identically dressed police recruits sprinting up and down the rows! When we reached the stage, Bowman told us about the close relationship between Red Rocks and Denver Parks and Recreation. Since Red Rocks holds over 700 acres of natural lands, it is a perfect place to spend a morning or afternoon, walking the trails, observing wildlife, picnicking, or exercising. After our 70-stair downhill workout, Bowman showed us the backstage area. Much to our amazement, we were able to trace the footsteps of almost 100 years of musicians who’ve graced the Red Rocks stage. The dressing rooms were carved right into the sandstone rock, and hundreds of signatures from past performers adorned the hallway and stairs leading to the sound equipment. Our tour reached its terminus backstage, where the group convened for a collaborative luncheon led by Storm Gloor of UC Denver College of Arts & Music, Lisa Gedgaudas representing the Denver Music Strategy and Denver Arts & Venues, Bryce Merrill for the Colorado Music Strategy, Shain Shapiro of Sound Diplomacy, Duncan McKie of FACTOR Canada, and participating local musician QBALA and Vancouver-based band Little Destroyer. Storm Gloor took the floor, first recognizing Matt Kowal of Majestic Collaborations and Lisa Gedgaudas of Denver Arts & Venues for their hard work in putting this whole event together. He then recognized the multi-talented students who helped coordinate this event. Many of his current and former students are involved in Canadarado in some capacity; and, evidenced by our enthusiastic applause, the whole room agreed that his CAM students were putting in impressive effort! Lisa Gedgaudas was up next. To continue from last night's introduction, she delivered a concise overview of Denver Arts & Venues, Create Denver, and her personal involvement in creating the Denver Music Strategy, which is set to release in a month. Gedgaudas is all about supporting the growth and development of Denver’s creative sector, and she wasn’t shy in mentioning that there are several obstacles in Denver’s way to becoming a global music city. Accordingly, the Music Strategy outlines and provides detailed solutions for tackling these obstacles through strong partnerships and funding, to name a few tactics. On behalf of the Bohemian Foundation, Bryce Merrill took the floor to speak about the Colorado Music Strategy. This strategy is the result of a partnership between Colorado Creative Industries and the Bohemian Foundation; its goal is to increase revenues opportunities for Colorado-based musicians so that they can practice their music but still retain a decent quality of life. Merrill outlined the need for a state-wide strategy to bridge the gap between Denver, a city of 2.8 million, and its surrounding towns and far-flung rural areas. To overcome resource limitations, the Colorado Music Licensing Project helped increase revenues for Colorado-based bands – Merrill provided an example of this when a Bank of Colorado commercial featured a song by Trout Steak Revival, a local folk group, instead of outsourcing the music for the commercial to an out-of-state band. Merrill also mentioned DeTour, an alternative concept of music touring which is community-based, creatively rewarding, and sustainable. To round out the speakers, QBALA and Little Destroyer spoke candidly about their experiences rising in the music world. 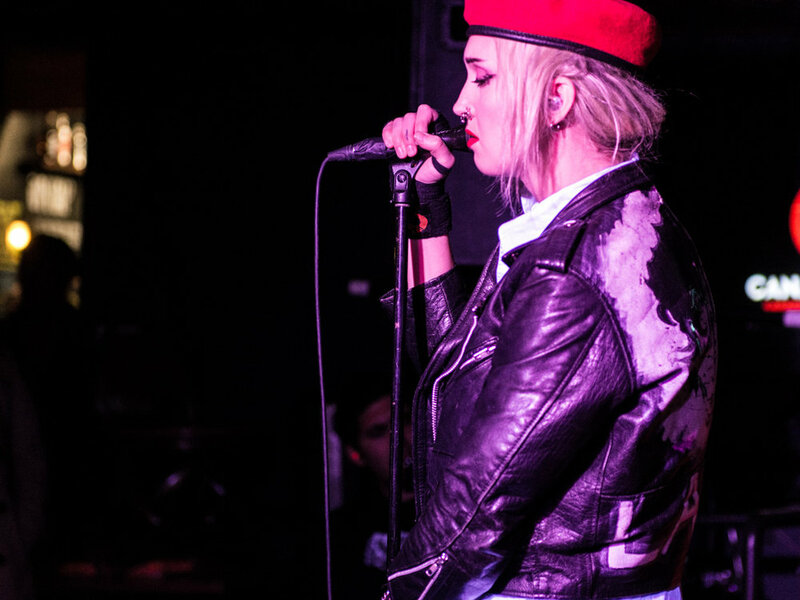 QBALA recounted her struggles to get her bills paid as a working musician. After trying to make ends meet in Fort Collins, she moved to Portland so that she could have a better quality of life. QBALA credited her networking skills as one of the reasons she was able to succeed in Portland. Without hustling, working nights and days, she wouldn’t be able to practice her craft authentically and meaningfully. Creating her music, and getting up on stage and sharing it with everyone is like therapy for her, and so important for personal growth. Everyone should have a fair chance to create. Everyone who spoke today is instrumental to Candarado's mission: to inspire advocacy for Denver's music community, and to augment creative and business opportunities across musical industries and educational sectors in Canada and Colorado. Red Rocks was a perfect venue to incite inspiration and collaboration. Next, Canadarado journeys to Su Teatro for some creative respite and to experience the first musical showcase of the weekend. After their first trip to Red Rocks, Yes We Mystic stopped by Colorado Public Radio to perform at OpenAir. Click "Listen Here" below to stream their session composed of four songs and brief anecdotes from the Winnipeg band. Before heading over to Su Teatro, a portion of the group made their way over to 7S for a private tour of one of Colorado's foremost boutique artist management agencies. 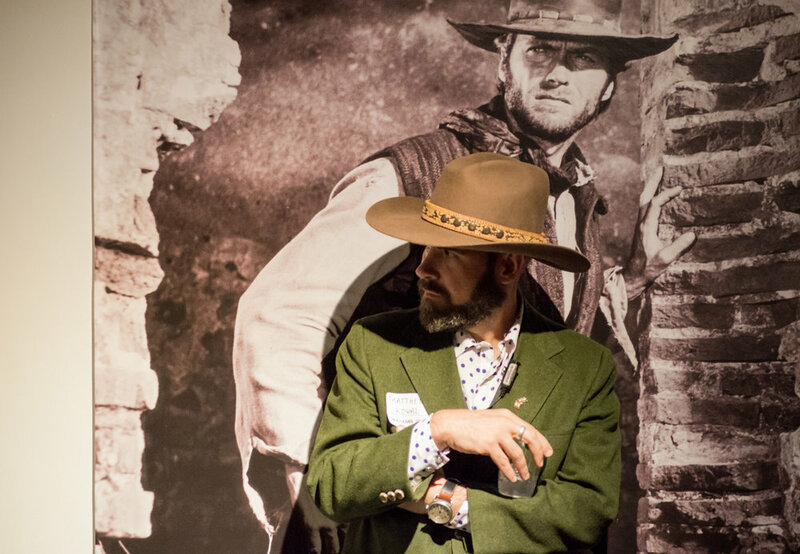 With clients such as Nathaniel Rateliff (& the Nightsweats), Dinosaur Jr, and Brent Cowles, 7S was the perfect place to explore the unique attributes of the regional musical economy and the concert promotion landscape in Denver. After our adventures at Red Rocks, the Canadarado group convened at Su Teatro, also known as "Your Theater." This historic theater is the third oldest Chicano theater in the country, and was the perfect place to host our first musical showcase of the weekend. Much like Canadarado's mission, Su Teatro's mission is to support and preserve cultural arts, and to "advance mutual respect for other cultures; and to establish avenues where all cultures may come together." The evening at Su Teatro began with authentic cuisine and conversation, and a riveting introductory performance by El Mariachi Juvenil de Bryant Webster, the first elementary mariachi group in the Denver Public Schools system. Then, we experienced 30-min sets from most of the bands participating in the Canadarado weekend. Below are some candid shots of the performances of Yes We Mystic (Manitoba), Ponteix (Saskatchewan), iZCALLi (Colorado), Little Destroyer (British Columbia), QBALA (Colorado/Oregon), and nêhiyawak (Alberta). The morning after the festivities at Su Teatro, Canadarado participants made the journey from Denver to the Music District of Fort Collins. After receiving a tour of the facilities, we met with Bryce Merrill, music programs manager of the Bohemian Foundation, Tom Milligan, VP of External Relations at Colorado State University, and Jesse Elliott, Director of the Music District, who all exuded passion for the Fort Collins and its burgeoning arts community. After gathering over coffee and conversation, Bryce Merrill greeted us with a bit of history behind the Bohemian Foundation, a “private family foundation that supports local, national, and global efforts to build strong communities.” The foundation tackles many issues such as homelessness, education, and healthcare. 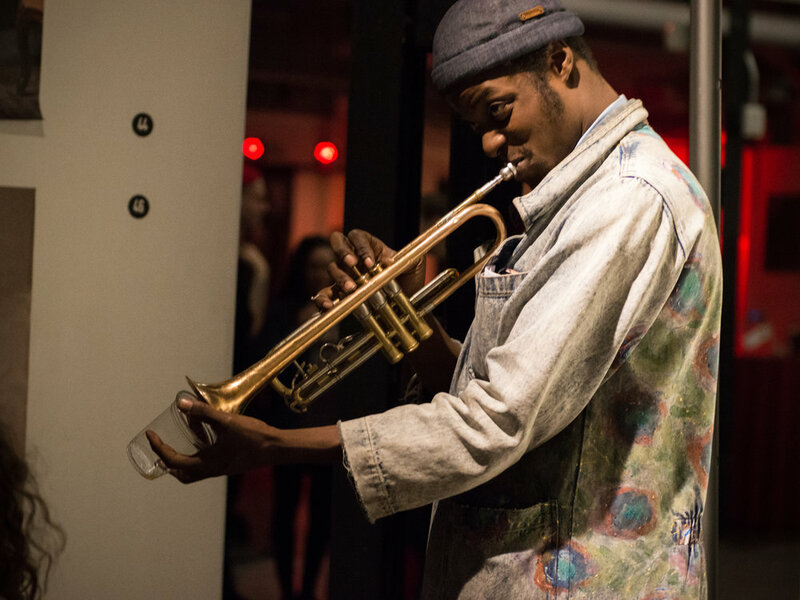 In addition, the Bohemian Foundation supports the Music District, which is designed to help musical amateurs and experts alike in honing their craft, learning the business of music, and sharing with other musicians and lovers of music. 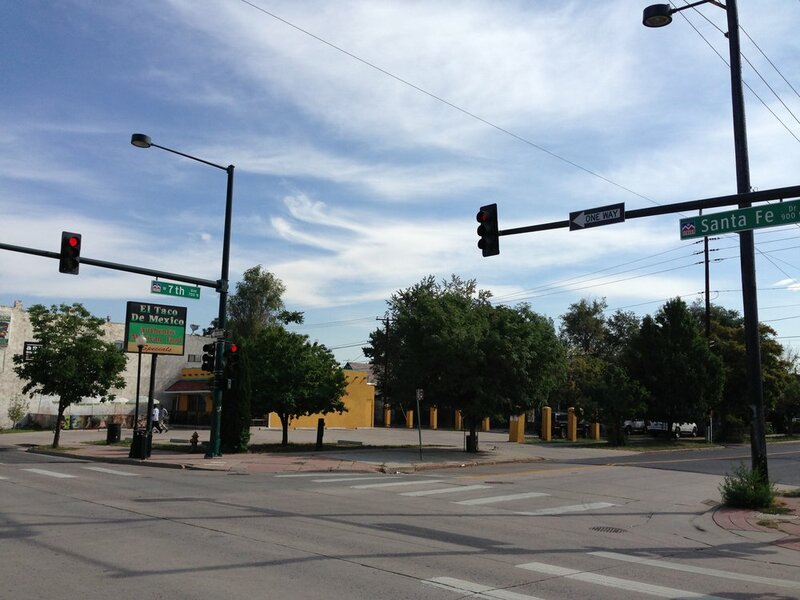 Merrill explained how the Music District is the heart of the Fort Collins music community along with Colorado State University and the other venues, such as Hodi’s Half Note, Mishawaka Amphitheater, Avogadro's Number, and the Aggie Theater. 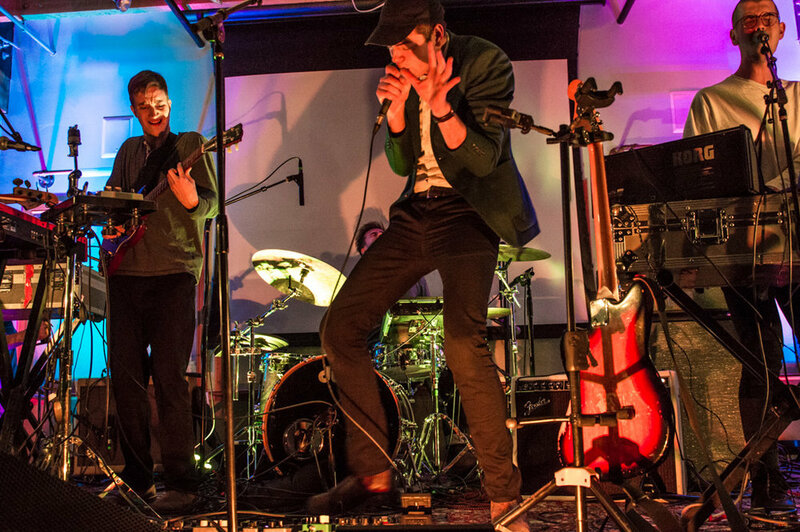 The Music District supports Fort Collins's musical ecosystem by acting like the connective tissue that fills in the gaps between musicians and these venues. Merrill admitted that Fort Collins is a music city way above its weight and it's only just going to grow as people continue to find out about its amazing music community. And, that's where the Music District comes in. Up next, Tom Milligan spoke about the Music District’s mutually beneficial partnership with CSU. “In Fort Collins,” he explained, “you can’t do public events without music.” The Music District helps cultivate bands and assists in getting bands hired for gigs. The Music District also helps with video production, and grooms musicians to understand the "ins and outs" of the music business. Its partnership with CSU just expands the depth and scope of what the Music District is able to accomplish. The last speaker, Jesse Elliott, spoke to the heart of the Music District. “We help from the cradle to the stage,” he said. The Music District provides musical support for children, from their youth to their adulthood: “We foster bands and help them stay in Colorado.” He described the Music District as a creative, professional, and community incubator for both amateurs and experts. After the inspiring introduction from our three speakers, it was time to form break-out groups so that we could really experience what it is like to advocate for music and musicians. We formed three main groups: Business of Music, Art of Music, and Community of Music. As a collective, we pooled some great ideas for each break-out group to ponder. The Business of Music group discussed sustainable touring strategies, ideas for partnerships concerning public and private funding, and aligning with brands, causes, or corporate entities. The BOM group also delved into how to create a professional pipeline for publicists, managers, promoters, light technicians, and sound engineers, as well as how to facilitate more cross-border musical trade opportunities. 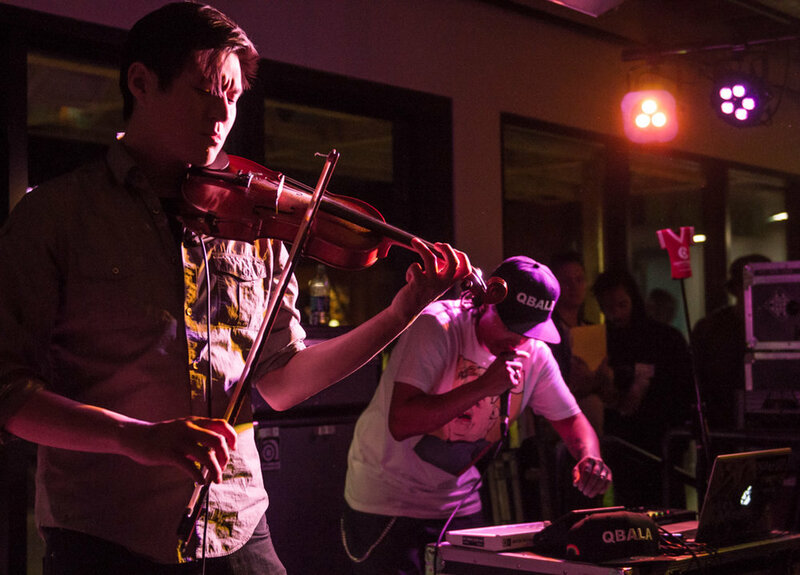 The Art of Music group dug into topics concerning musicians’ continued artistic development. Topics included balancing art with social and political agendas, openness to critical feedback, and sustainable artistic collaborations. They also discussed the importance of forming a skills collective, a social platform for sharing skills, contributing to others’ needs, and focusing on craft. The final group, The Community of Music, delved into four main topics: acknowledging and respecting the pre-Western heritage of venues like Red Rocks; creating inclusivity; supporting mental health, addition recovery, and safe-space protocol at venues for touring musicians; and audience development. This near-final event of Canadarado where we were able to learn from others and experience music advocacy brought enriching and constructive results. Gathering and collaborating at the Music District was an excellent way to punctuate the weekend, but not as a full-stop or even an exclamation point. It was more like an ellipsis to the next time when we get together. Perhaps wheels will continue to turn and churn out actual opportunities to make a difference in the music world, whether it is in the business, the art, or the community of music. Our weekend drew to a close with amazing performances by Ponteix, Brent Cowles, QBALA, Yes We Mystic, Little Destroyer, and nêhiyawak. Everyone involved in the production of Canadarado was left with a renewed spirit to continue this important musical trade mission by creating, collaborating, and capitalizing on initiatives to improve and expand Colorado's musical ecosystem. Photos above are by Veronica Lee of www.vleephotographs.com. 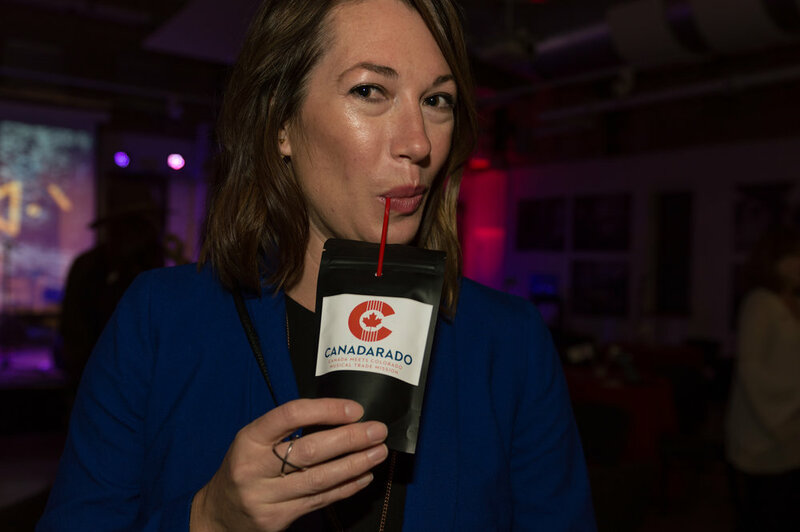 We would like to extend a special thanks to Ali Cornish, Denver Beer Company, Kim Ba, Miguel Hernandez and Mental Lounge Video, Monte Mead, and Nomad Sound for providing their talents and services for the benefit of the Canadarado Musical Trade Mission.